The Maxxia Wallet is a technology-loaded smart card that makes claiming everyday living expenses, such as fuel and groceries, fast and easy. If you don't have a Maxxia Wallet - or if you've already paid for the item - you can submit a claim for reimbursement. Maxxia app is another easy way to make a claim, anywhere, anytime, from an Apple or Android mobile device, such as smart phones and tablets. With built in camera functionality, all you need to do is click, claim and go! With Maxxia Online and the app, you can submit a claim for reimbursement or set up a payment direct to a supplier. For payments you've already made, we will reimburse the money into your nominated bank account, generally within 2-3 business days - it's that easy! Once received, we'll process your claim within 2-3 business days and deposit the funds from your salary packaging account into your regular bank account. By getting taxed on a lower amount and effectively paying less tax, your disposable income could be increased. This could leave you with more to spend at each pay cycle. It’s a fair question, but no. It’s 100 per cent Australian Tax Office-approved, and hundreds of thousands of Australians benefit from salary packaging every year. Offering salary packaging is a popular way within both the private and public sectors for employers to incentivise staff. The types of benefits you can salary package, and how much, depends on what your employer offers, as well as what the Australian Taxation Office allows for your particular industry. Rest assured, Maxxia’s tax and compliance specialists are up to speed with all ATO rulings and developments in Fringe Benefits Tax legislation to ensure we can accurately and efficiently service your salary packaging needs. Is salary packaging difficult to manage? No. This is where Maxxia comes in: we take care of the hassles, and you enjoy the benefits. After we set up your salary packaging arrangements, we also manage them for you. This means that we pay for your nominated expenses on your behalf – using your pre-tax dollars. No more juggling bills and due dates! And when it comes salary packaging with Maxxia you can rest assured our fees are completely transparent. In exchange for managing your salary packaging account, we charge an administration fee that is dependent on the benefit and agreed upon with your employer. All fees are paid out of your pre-tax dollars and don’t contribute to your cap limit or attract FBT. Do many people salary package? Hundreds of thousands of Australians have enjoyed the many benefits of salary packaging with Maxxia, Australia’s largest provider of employee benefits, since 1988. When it comes to unparalleled customer care, ease of claiming, access to the best third-party offers and nationwide buying power for novated leases, Maxxia continues to set the standard for salary packaging in this country. Employers offer salary packaging to reward staff for their loyalty and hard work, but it’s not a benefit offered by all companies. So if you’re one of the lucky ones, we’ll take you through the many advantages of salary packaging. We all want to pay less tax, right? With salary packaging you potentially can, by paying for some expenses with your pre-tax wage – think mortgage, rent, work-related costs and everyday items such as groceries. When you salary package, you’re still paying for your usual expenses, but with pre-tax dollars – meaning you are reducing your taxable income and, in turn, potentially increasing your taxable income. At each pay cycle you could have more money to spend on the things you want – such as new clothes or a well-deserved weekend away. The choice is yours. By salary packaging a car through novated leasing, you could reduce the cost of keeping your vehicle on the road – and, perhaps, finally afford your dream wheels. Basically you bundle the lease and the car’s running costs (including fuel, registration, insurance, servicing and maintenance) into one regular payroll deduction. And because you’re using a combination of pre- and post-tax dollars, you’re not only saving time but money, too. You don’t need a huge income to benefit, and you can package a new or used car, or even your existing vehicle. I don’t work full-time – am I still eligible? No matter how many hours you work or your employment status – full-time, part-time or casual – if you’re paying income tax and your employer offers salary packaging, you could be eligible. A point to note though: employees earning less than the tax-free threshold of $18,200 may not have to pay income tax, and incomes under the Medicare levy threshold of $21,655 do not attract the Medicare levy. How much you could save through salary packaging could be impacted if you earn less than, or just above the tax-free threshold. We recommend you seek independent advice before proceeding with salary packaging. What does it cost to salary package? When it comes salary packaging with Maxxia you can rest assured our fees are completely transparent. In exchange for managing your salary packaging account, we charge an administration fee that is dependent on the benefit and agreed upon with your employer. All fees are paid out of your pre-tax dollars and don’t contribute to your cap limit or attract FBT. Salary Packaging Cap limits are set by the Australian Taxation Office, and specify the amount of before-tax money you can use for certain items each FBT year. If you salary package capped benefits over your cap limit, FBT will be applied to the expenses – and you could pay tax on the extra. The FBT cap you can salary package up to depends on the industry you work in. Health employees can salary package a range of benefits (including living expenses such as mortgage, rent, utility bills and groceries) up to $9,010 each FBT year. Charity employees can salary package a range of benefits up to $15,900 each FBT year. Rebatable employees can salary package a range of concessionally-taxed benefits up to $15,900 each FBT year. Depending on your employer, health and charity employees could also be eligible to package an additional $2,650 for Meal Entertainment expenses each FBT year. What’s the difference between capped and "above the cap" benefits? If you work in the public health or charity industry, you will notice that benefits may be ‘capped’ or ’above the cap’ – depending on the expense type and sector you work in. Most above-the-cap benefits – such as novated leasing a vehicle, work-related devices, self-education and additional superannuation payments – have no limit and do not incur FBT. Meal Entertainment and venue hire (additional combined cap limit of $2,650 each FBT year). What are the benefits of packaging with a HECS/HELP debt? 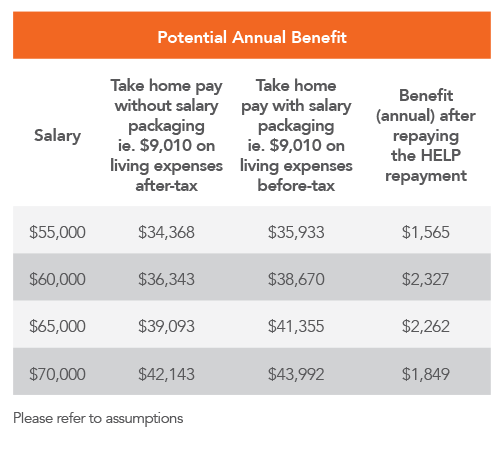 You can benefit from salary packaging even if you have a HELP (Higher Education Loan Program) or HECS (Higher Education Contribution Scheme) debt. When you salary package, you are using money before it gets taxed. This could reduce your taxable income – and increase your disposable income. How will my HECS/HELP debt impact my salary packaging? If you have a HELP debt, you may need to adjust your HELP repayments when you salary package. This is because your HELP repayments are calculated based on your ‘HELP Repayment Income’ (HRI). In most cases, this will be your annual taxable income plus your total reportable fringe benefits amount shown on your PAYG Payment Summary. 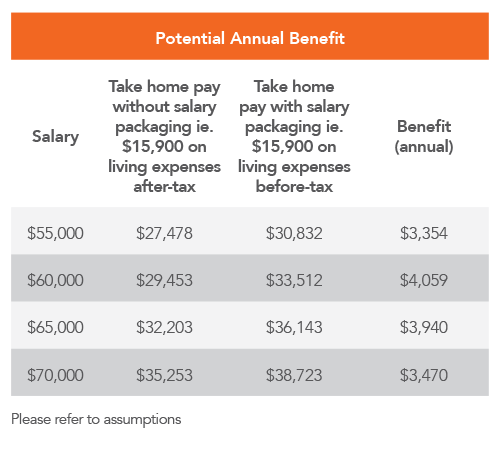 Although salary packaging can reduce your taxable income, it can increase the gross value of your salary. This is referred to as your 'adjusted taxable income'. Your adjusted taxable income equals your salary plus the gross value of your fringe benefits (e.g. $40,900 + $17,000 = $57,900). You should seek financial advice if you're unsure. Will my payroll department automatically adjust my HELP repayments once I start salary packaging? No. You must advise your payroll department of the HELP debt repayments you need to make. While each employer is different, in most cases your payroll department will be able to help you manage the process and changing your HELP repayments is quite simple to do. Once you have completed the relevant paperwork, any additional HELP amounts should be deducted from your pay. Can I salary package additional HECS/HELP debt repayments? Yes you can. Additional HELP repayments can be salary packaged if you wish to pay your HECS/HELP debt off sooner. Barry has a debt of $4,500 and makes a $1,500 voluntary repayment, reducing his total debt to $3,000. Use our HECS/HELP calculator for salary packaging. Contact us on 1300 123 123 to see how salary packaging could help you pay your HECS/HELP debt off sooner and increase your disposable income. What are the current HELP repayment rates? How much could I save with salary packaging if I have a HECS/HELP debt? ASSUMPTIONS: Estimated annual benefit based on an eligible employee salary packaging the full $9,010 per annum limit. PAYG tax rates effective 1 July 2018 have been used. HELP repayments are based on 2018-2019 HELP repayment thresholds and rates. An average administration fee of $220 is included in the example. The actual administration fee that applies to you may vary depending on your employer and may alter the calculation. Estimated annual benefit based on the assumption that an employee does not have any accumulated Financial Supplement debt. Your benefits will vary depending on your income and personal circumstances. Compulsory HELP repayments commence once your adjusted taxable income reaches $51,957. IMPORTANT INFORMATION: The information provided in this brochure is factual information only and is not intended to constitute taxation or financial advice on the relative merits of salary packaging or on any other basis.Benefits and savings will vary depending on personal objectives, financial situation and needs. Maxxia recommends obtaining independent financial advice before making any financial decisions. Eligibility criteria and terms and conditions apply. All salary packaging proposals are subject to the requirements of the employer. Fees and charges apply. Maxxia may pay and receive commission or rebates in connection with some services and products it provides or arranges to be provided by third parties. ASSUMPTIONS: Estimated annual benefit based on an eligible employee salary packaging the full $15,900 per annum limit. PAYG tax rates effective 1 July 2018 have been used. HELP repayments are based on 2018-2019 HELP repayment thresholds and rates. An average administration fee of $220 is included in the example. The actual administration fee that applies to you may vary depending on your employer and may alter the calculation. Estimated annual benefit based on the assumption that an employee does not have any accumulated Financial Supplement debt. Your benefits will vary depending on your income and personal circumstances. Compulsory HELP repayments commence once your adjusted taxable income reaches $51,957. IMPORTANT INFORMATION: The information provided in this brochure is factual information only and is not intended to constitute taxation or financial advice on the relative merits of salary packaging or on any other basis. Benefits and savings will vary depending on personal objectives, financial situation and needs. Maxxia recommends obtaining independent financial advice before making any financial decisions. Eligibility criteria and terms and conditions apply. All salary packaging proposals are subject to the requirements of the employer. Fees and charges apply. Maxxia may pay and receive commission or rebates in connection with some services and products it provides or arranges to be provided by third parties. How do I make sure I don't end up with a shortfall at tax time for unpaid HECS/HELP repayments? Salary packaging could reduce your taxable income but may affect the way the ATO calculates your HECS/HELP repayments – which could leave you with a tax bill at tax time. So your employer may not be taking out enough HECS/HELP repayments or in some cases, may not be deducting any HECS/HELP repayments at all. To avoid a possible shortfall at tax time for unpaid HELP repayments, you need to let your payroll department know when you start salary packaging as they may need to increase or recommence the amount of your withholding tax deductions. While each employer is different, in most cases your payroll department will be able to help you manage the process and changing your HECS/HELP repayments is quite simple to do. Your payroll department may have its own form or they may ask you to use the ATO's form Tax declaration form or Withholding tax form. Check with your payroll department first. This is quite simple to do and in most cases your payroll department will be able to help you manage the process.